Enjoy a sailing day trip along the Costa Dourada. Leaving from the Olympic Port of Barcelona you will sail for 4hrs along this beautiful coastline until reaching Sitges, a charming resort village of the Costa Dourada (Golden Coast). 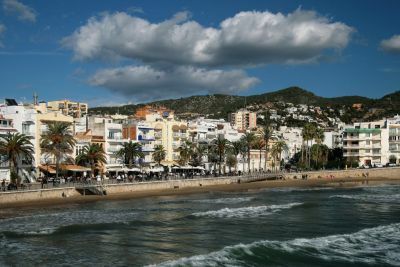 Dis-embarking in Sitges the sailing portion of the trip ends and you will have some free time to explore Sitges and have lunch in a traditional restaurant which we have selected for you. After you will be picked up by an English-Speaking Chauffeur who will transfer you back to your hotel in Barcelona. Come discover the Costa Dourada from the Sea! Dis-embarking at the Marina if Sitges you will then have time on your own to wander the streets of the old quarter or just sit and relax on the beach. We have reservation a table for your lunch at a recommended restaurante. In the afternoon your will be picked up by a private English-Speaking chauffeur who will transfer you back to your hotel in Barcelona. 1 bottle of Cava, Beverages and snacks aboard the yacht. (LR) 1 Lunch *Table Reservations in Restaurants listed in itinerary (*Meal not included, must order directly at the restaurant a la carte).